In this photo provided by Mehr News Agency, demonstrators attend a pro-government rally in the southwestern city of Ahvaz, Iran, Jan. 3, 2018. Iranians reacted dismissively to a series of pro-government rallies held in the country Wednesday, saying they appeared to have been coerced, in contrast to the spontaneity of a weeklong anti-government protest movement that has posed the biggest domestic challenge to Iran's ruling clerics in eight years. The callers said many of the pro-government demonstrators were teenage students sent to the rallies by schools. They said many of the others were military personnel in plainclothes and government employees fearful of losing their jobs if they did not participate. 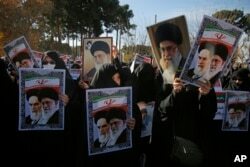 In this photo provided by Tasnim News Agency, women hold posters showing portraits of late Iranian revolutionary founder Ayatollah Khomeini, and Supreme Leader Ayatollah Ali Khamenei during a pro-government rally in the holy city of Qom, Iran, Jan. 3, 2018. A man who gave his name as Ahura, calling from the central city of Isfahan, told Straight Talk that Iranian authorities had staged the demonstration that he saw. Several other callers to VOA Persian shared similar perceptions of the pro-government rallies as having been orchestrated by the Iranian government, but the claims could not be independently verified. Western media reported that thousands of government supporters joined Wednesday’s demonstrations. Iranian state media said the rallies were held in more than 10 cities around the country, including the Shiite religious center of Qom, and the western cities of Ahvaz and Kermanshah. 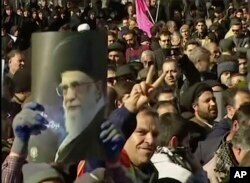 State television broadcast live footage of the daytime rallies, in which marchers waved Iranian flags and portraits of supreme leader Ayatollah Ali Khamenei and chanted slogans in support of Iran’s Islamist establishment. The state-run Press TV network said the marchers had gathered to condemn deadly violence that has erupted at some of the daily anti-government protests that began Dec. 28 and quickly spread nationwide. This frame grab from video provided by Iran Press, a pro-government news agency based in Beirut, shows pro-government demonstrators marching in, Arak, Iran, Jan. 3, 2018. Tens of thousands of Iranians took part in pro-government demonstrations in several cities. The anti-government demonstrators mainly have been marching peacefully to protest the high cost of living and perceived government corruption. They also have called for an end to the rule of Iran’s Islamist clerics. Iranian state media have said at least 20 people have been killed in the protests, some of which escalated into street confrontations between demonstrators and security forces. But Iranian authorities have not publicly disclosed who or what caused the fatalities. Messages sent by people in Iran to VOA Persian said anti-government activists rallied again in several towns on Wednesday, marking the seventh straight day of protests. One video sent from the northern Iranian town of Nowshahr showed demonstrators chanting, “Death to the dictator” — a common slogan of the recent protests, aimed at Khamenei. The messages also said Iranian security forces had increased their presence on the streets of various cities Wednesday, dissuading many people from joining further anti-government rallies. Iranian President Hassan Rouhani has responded to the protests by acknowledging the right of people to demonstrate and criticize his government. But Iranian officials also have vowed to stop what they see as a wave of violent attacks by saboteurs against government institutions. VOA Persian's Mohammad Naficy, Behrooz Samadbeygi and Afshar Sigarchi and VOA correspondent Masood Farivar contributed to this report.